I wanted to knit something with the little scraps of yarn that I didn't have the heart to throw away, especially considering how pricey yarns have become these days, even just acrylic baby yarn. The pattern is sort of made-up - extrapolated from crochet pattern I usually use for sweaters. 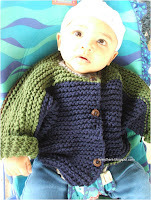 I am essentially a crocheter, knitting is only a secondary thing for me. I didn't plan on using any color scheme, just joined the next color as one color got used up. It is done sort of like the kimono sweater that I love to crochet - starting at the back bottom, working the back, sleeves and neck and the fronts - except rather than overlapping fronts to make the kimono style, I left it like a cardigan. 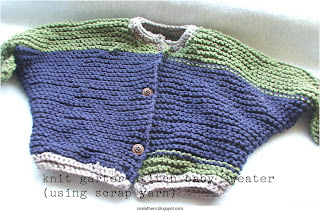 The whole sweater is done in simple garter stitch with a size 12 or so large needles. I sewed the seams and finished the edges with crochet. He does indeed. That's darling! Hi, Can you also pls post the patterns for these sweaters. They re very lovely! HI Ariel, I didn't follow a specific pattern - the link in the post shows Julie's pattern for crochet kimono sweater - I simply made it up as I went along converting crochet to knitting... so, sorry, I don't have a pattern to share with you :( Cheers! Sheela.